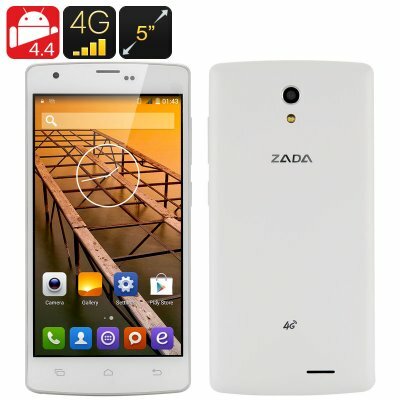 Successfully Added Zada Z2 64 Bit Smartphone - 4G, 5 Inch IPS Screen, MTK6732 Quad Core CPU, 1.5 GHz, Dual SIM, 1GB RAM, Android 4.4 (White) to your Shopping Cart. The Zada Z2 adopts some thoughtful design with advanced technology and wraps it all in an elegantly designed case for your pleasure. Featuring a 64 Bit 1.5GHz Quad Core CPU the Zada Z2 packs a high speed performance and incorporates a Mali T760 GPU that allows you to enjoy 3D games and HD videos without interruption. The 4G network capabilities add to this as you can quickly access and download online content faster than most land line services as this category of cellular communication can reach speeds of 150Mb/s for downloads, great for some quick on the go entertainment while on your daily commute or for catching up on the latest episodes if you have to stop late at the office. With smart wake controls you can really stream line interactions with the user interface, simply drawing a character on the screen can open one of several pre set applications and once there make use of the smart gesturing functions. This is controlled by detecting the movement of your hand as it passes over the phone and without even touching the device you can browse music on your phones player or scroll through pictures in your gallery. The Z2 comes with the android 4.4 OS installed and this offers a host of useful features that allow for great optimization as well as streamline operations and brings a good boost to performance. With Android 4.4 operations are much easier and helpful organization of contacts by most frequently used as well as better integration between messaging and dialer apps not to mention the powerful voice command driven assistant that is Google Now will all save you time and improve your Smartphone experience. If you like snapping photos then the 13MP rear camera is a nice touch and does a great job of capturing all your favorite moments. Swap and share them with other phones using the HotKnot function which works in a similar way to NFC. This product is in stock now, we guarantee next working day shipping and offer a 12 months warranty on all our products. Brought to you by the leader in electronic devices as well as wholesale smartphones, Chinavasion..